--- Exeposé [read in full]. It is 2023. Scientist David Proctor is running for his life. On his trail is Saskia Brandt, a detective with the European FIB. She has questions. Questions about a bomb that exploded back in 2002. But someone is hunting her too. The clues are in the shattered memories of her previous life. She has only hours to decipher them. As Proctor attempts to leave England, heading towards a future he cannot imagine, Brandt knows only this: Those who ignore history are doomed to repeat it. 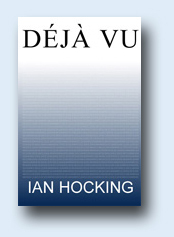 Déjà Vu takes the reader on a startling journey through a possible future, through digital minds, and through the consequences of the choices we make. It is the debut novel by Ian Hocking. BestBookPrice.co.uk maintains a list of places from which to buy Déjà Vu. Note that Forbidden Planet offer a 25% discount.